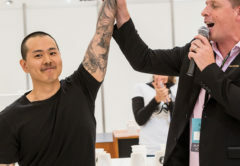 Taking over the title from 2018 WBC winner Agnieszka Rojewsk of Poland, Jooyeon was overcome with shock and emotion upon the final announcement at the Specialty Coffee Association Expo in Boston, United States on 14 April. Michalis Dimitrakopoulos of Greece placed second, Cole Torode of Canada placed third, Mikael Jasin of Indonesia placed fourth, Wojtek Bialczak of Germany placed fifth, and Mathieu Theis of Switzerland placed sixth in the Finals round. Australia’s Matthew Lewin of Ona Coffee placed 11th in the competition. WBC finalists Mathieu Theis, Mikael Jasin, Jooyeon Jeon, Michalis Dimitrakopoulos, Cole Torode, and Wojtek Bialczak. 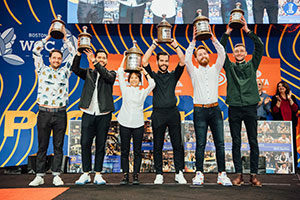 Fifty-five national barista competitors competed over four days in the 2019 WBC, which took place inside the expo trade show. Competitors prepared four espressos, four milk drinks, and four original signature drinks to exacting standards in 15 minutes. Jooyeon’s routine focused on creating a “happy and inclusive” environment for her customers, or judges in this case. For her WBC routine, Jooyeon used a Sierra coffee, a cross between Typica and Bourbon, and the same brew recipe for each of her beverage courses. The coffee was sourced from La Palma and El Tucan farm in Colombia, and underwent natural aerobic fermentation. 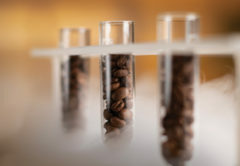 By using critical technology to extract polysaccharides and add carbohydrates during farming and processing, consultant Federico Bolanos of Al Quima Coffee Company says this is one of the reasons why Jooyeon’s signature coffee was so special. “Her drinks displayed a sweetness that had never been displayed before – it had always stayed in the puck or in the ground coffee. For the first time the judges were tasting a different type of sweetness here on the stage,” he says. Federico says during roasting, most carbohydrates degrade or vanish. 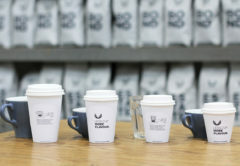 As such, during the signature drink Jooyeon reincorporated the lost carbohydrates from her coffee, a technique Canadian Barista Champion Benjamin Putt originally displayed in his WBC performance, and one that Jooyeon used with a different approach. “This concept had complete synergy with Jooyeon’s drinks, and I think the judges enjoyed it,” he says. Jooyeon has been working as a barista at Momos Coffee since 2007. 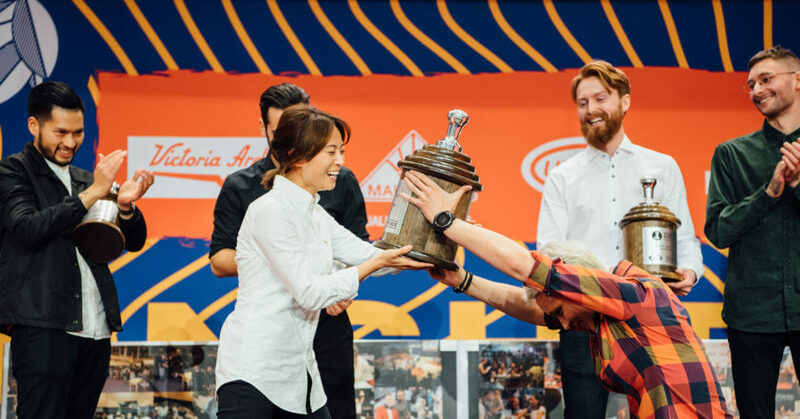 She started competing in South Korea’s barista competitions in 2009 and after 10 attempts, won the 2018 national title. This year, Jooyeon says the key to her winning routine was taking a relaxed approach and enjoying the competition process. Despite her newly-acclaimed world title, Jooyeon wants to continue working as a barista and hopes to venture into green bean buying for Momos Coffee. 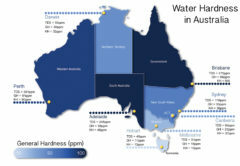 “I hope to visit Australia very soon – and hopefully attend next year’s WBC in Melbourne,” she says of the event, taking place at the Melbourne International Coffee Expo in May 2020. To celebrate her win, Jooyeon and her South Korean team of supporters will attend a group dinner tonight followed by some much needed rest.